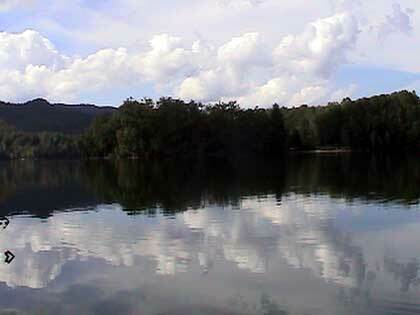 Bear Creek Lake is one of our favorite paddling spots in the Western part of North Carolina. The pictures here are from our 2002 trip, the last time we were there. 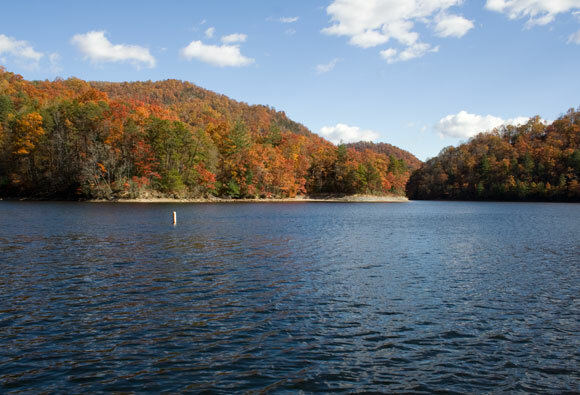 Bear Creek Lake is a special place, one you should add to your list. We plan to return there sometime soon. 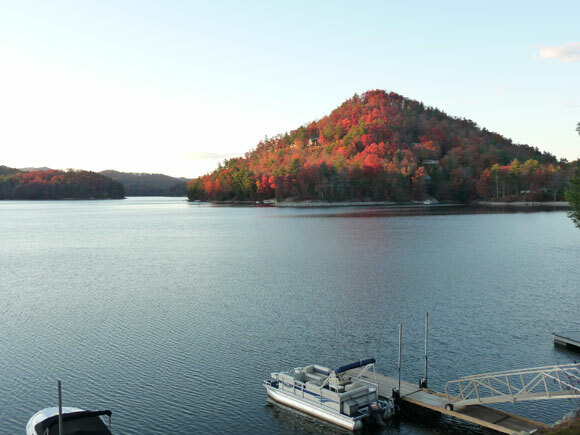 Bear Creek Lake is the largest of 4 lakes built on the Tuckasegee River by Nantahala Power and Light Co. in the mid-1950's to provide hydroelectric power for the area. 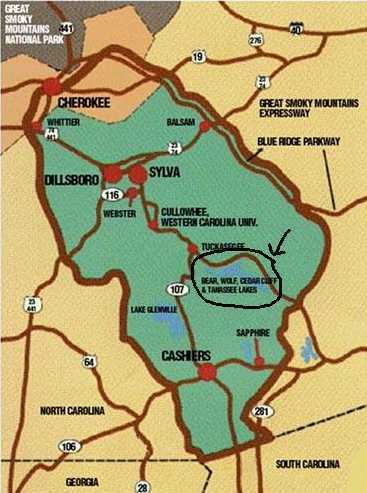 Tanasee Creek Lake, Wolf Creek Lake, and Cedar Cliff Lake are the others. We have paddled Wolf Creek Lake but neither of the other two. 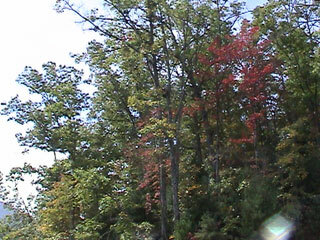 The past time we were there (fall of 2002), the lake was undeveloped. We had to share the boat ramp with a couple of people launching to go fishing, but they weren't going anywhere we were headed. So we pretty much had the lake to ourselves. 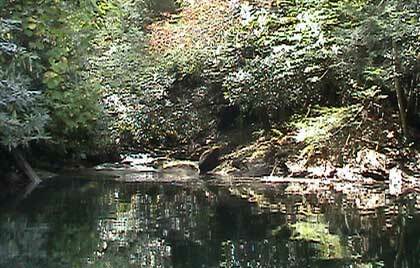 One of the things we like about the lake is that there are lots of small streams feeding into it. The have such a nice sound. You can find these little feeder streams as you paddle along the perimeter of the lake. Usually you can hear them before you see them. There are no birds on the lake, at least not in the fall when we've paddled here. 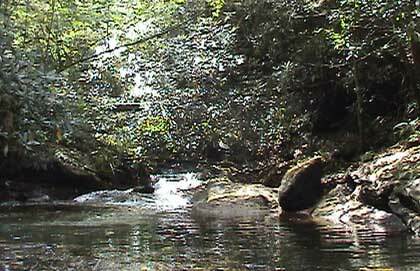 This is one of the differences between paddling at the coast or around home in Durham and paddling in the mountains. 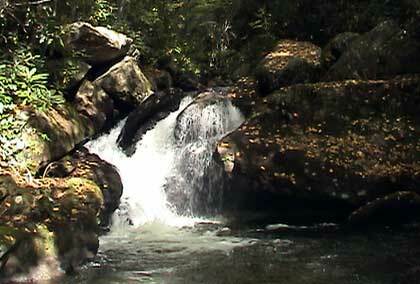 The attractions in the mountains are the scenery and the small streams feeding into the mountain lakes. There is a waterfall at the east end of the lake. This is about as far from the boat ramp as you can get. This is a good place to park Nessie and take a short hike to see more of the falls. It's a rock scramble and there's no path. So you can't go too far. 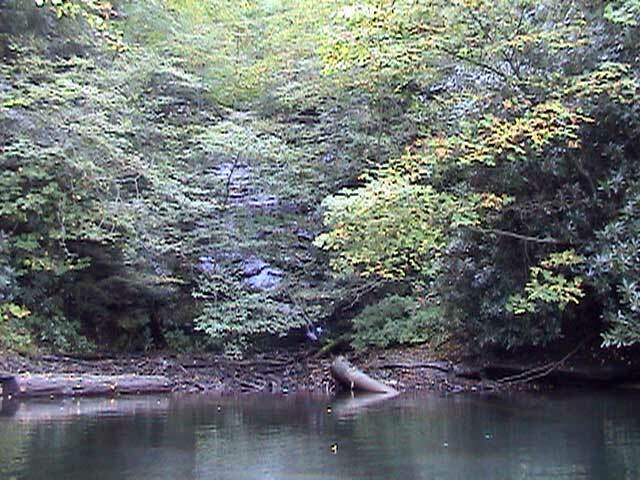 We have always paddled here in the early fall (October 10 in 2002)--generally too early for peak fall colors. Judging from the number of rhododendron around the lake, June should be very pretty here too. 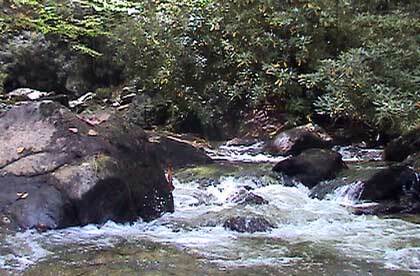 All in all this is a great place to spend a day paddling. View of Bear Creek Lake from Boat Ramp in 2008. We had a chance for a quick visit to Bear Creek Lake in 2015. We didn't have a chance to paddle, just a quick look from the boat ramp. The boat ramp area has been rebuilt and greatly improved. Even had potties. However, there has been considerable development of the area around the lake. Judging from the size of the parking lot at the boat ramp, lake is probably crowded at peak use times. The Bear Creek Lake can be found on the Big Ridge USGS quad topo map. The latitude and longitude coordinates for this reservoir are 35.2418, -83.0715 and the altitude is 2559 feet (780 meters). 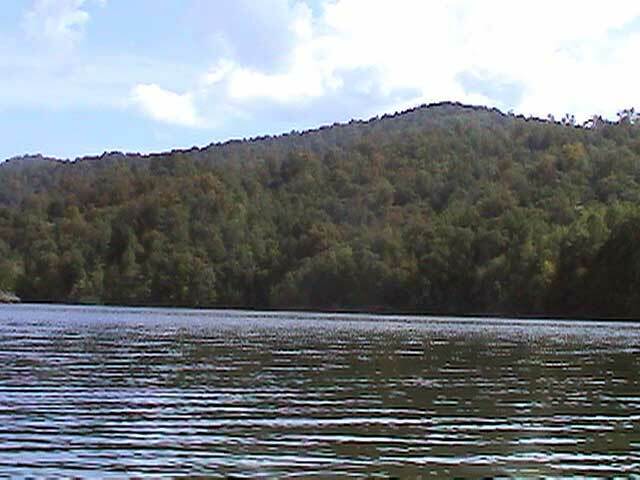 Bear Creek Lake is located on NC 281. 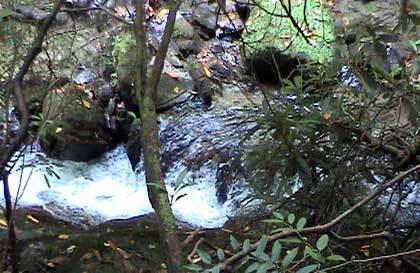 From Casiers take NC 107 North Past Lake Glenville. Turn right onto NC 281. Travels with Nessie Home :: Site Map:: Contact webmaster@ncsparks.com-email us:: Copyright Leslie Sparks 2006, 2007, 2008, 2009, 2010, 2011, 2012,2013,2019:: Last modified: April 19 2015.